Here is a set of 4 machine embroidered 6 1/2 inch snowball blocks. Get creative and let's see what you can do with them. The blocks are beautiful! I have never tried Hatched in Africa designs. I'll have to check them out. 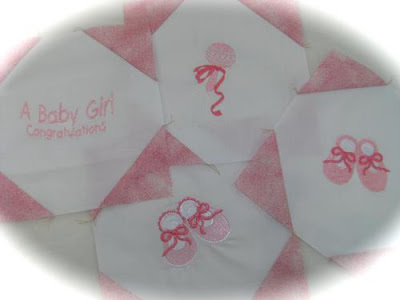 I love the little embroidery blocks and I don;t have an embroidery machine so Pick Me! Those pink embroidery blocks from South Africa are so beautiful. I don't have an embroidery machine. What makes these blocks so special to me is that I was born in South Africa. With the addition of a few more blocks, these would make a wonderful quilt to donate to the NICU. I make lots of preemie quilts and this would certainly be a different design for me.